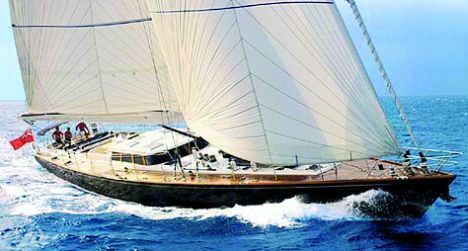 Cinderella II is a sloop just under 32 metres offered by Forzatre a charter company specialised in chartering yachts of different types and size. She's fitted out to ensure maximum comfort and safety even on cruises in extreme conditions. Speed under engine: 8/9 knots. For further information please contact: Forzatre, via dei Devoto, 77; 16033 Lavagna (GE), Italy; tel. +39 0185 360205; e-mail forzatre@forzatre.it; web site www.forzatre.it. Hence she's got ample welcoming well furnished spaces and futuristic technology. Cinderella's exteriors also enable one to relax in the sun whilst not playing, perhaps, with the numerous water games she has stored in her large stern locker/garage. Amongst these, there is a RIB tender powered by a 50 HP Yamaha outboard, water skiing equipment, two windsurfs, a canoe, snorkelling gear, and fishing tackle, in short, everything possible to allow her guests to enjoy to the outmost their holiday on the sea. Who created the interiors must have thought along the same lines since there's a library with a section dedicated exclusively to films and music, coupled to the most recent generation of audiovisual systems and of course, air conditioning in every area. The guests' sleeping accommodation is at the bows and has two huge cabins with double beds and own bathroom, another double cabin with a self contained bathroom, and towards the stern, yet another guest cabin with a self contained bathroom though with separate berths. These cabins are all connected via a central corridor accessible from mid ship's where there is a main saloon at full beam. 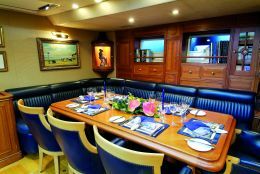 In this area to starboard, there's a saloon with a "U" shaped sofa, a central table, and bar cabinet to its stern, whilst to port, there's the dining area with an "L" shaped sofa and chairs along its sides. The décor inside is in wood with cloth finishes in different materials in which the colour blue prevails for the saloon and white for the cabins. 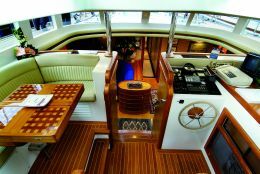 The central part of this yacht is worth mentioning, since Windship, Cinderella's shipyard, took advantage of the hull's dimensions to create a very attractive and bright saloon area enhanced by large glass panelling along the surrounding perimeter as well as with generous crystal skylights towards the bow on deck, giving unusual headroom and plenty of light. The décor, everywhere, is the clear result of an attentive research in design yet it is sober thanks to its classic choice which always pays off. 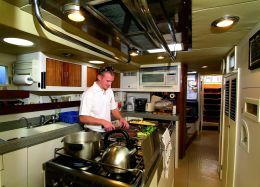 The spacious saloon outside, protected from the sky above by an appropriate bimini awning is an ideal place from which to enjoy cruising without minimally getting into the crews way which will be manoeuvring in a cockpit further astern. The two wheel steering cockpit has a comforting anti spray hood to shelter one from the sun or adverse conditions. Modern instruments and technology keep the yachts potential under control. For more demanding guests, Cinderella II has internet and satellite facilities thanks to a modern system that allows it to receive and exchange data. We were thus not at all surprised to learn that she is often chartered by the same people who have already experienced the pleasure of a comfortable sail aboard her or simply under engine enjoying the elements of the sea under every shape and form.